Home Directs Procurement Transformation Was Bill Levitt 1950's Tim Cook? My parents were in town last week, up from Alabama, and my dad's fascination with my neighborhood continues. 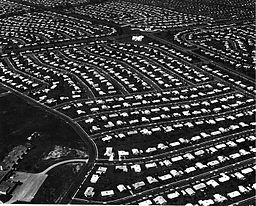 I live in Levittown, PA, purportedly the first planned and mass-constructed suburb/community in the nation. Probably depends on who you ask. Levitt was the first large-scale builder to construct houses on radiantly heated cement slabs. By foregoing a dug-out basement, Levitt estimated he saved consumers $1,000 per dwelling. This is a pretty good example of Process Redesign, where the process is home construction. The redesign of a home to no longer include a basement saved the company money, and the radiant floor heating (steel pipes laid into the foundation) reduced the need for additional cement reinforcement and bulky, space-consuming radiators. Sold as a cost-cutting convenience that actually saved Levitt time, money, and labor, this is a good example of a cost structure transformation. Tim Cook is heralded for transforming Apple's supply chain by consolidating suppliers and investing significant capital in them to secure rights to products. Here's an example of the same practices being conducted nearly 60 years ago. To increase efficiency, pre-cut lumber was bundled "combat loaded," with pieces needed first at top. Building materials, from siding to nails, were delivered in perfectly calibrated house-sized amounts to each house site. A classic example of what can be done with effective supplier management -- having one supplier alter their methods slightly to facilitate the needs of the next team in line, in this case the assemblers. Additional business practices considered relevant or innovative today but displayed in Levittown include consolidating manufacturing near final assembly and end users, as evidenced by the cement yard constructed on site that quarried the raw materials needed during construction. It was later deconstructed, and the quarry filled with water to become a community lake. Cost structure transformations outside of the sans-basement construction were evidenced in the use of bamboo curtains in lieu of closet doors, reducing the need and costs of additional framing and doors, and the use of linoleum tile flooring instead of carpet or wood; both being marketed as modern touches instead of cost-saving maneuvers. The allure of the mass-produced neighborhood has waned in recent years, partly due to the housing crash and partly due to the gentrification movement and suburban dismissal that a lot of home buyers are part of to this day. In the early days though, they were attractive and, as we've seen here, pretty groundbreaking in ways that didn't involve the actual breaking of ground. Though they were innovative there, too.